Thumbhole for easy removal from shelf. 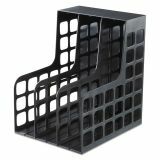 Pendaflex Plastic Magazine File, Two Snap-In Dividers, 9 x 10 5/8 x 12, Black - Shelf file holds binders, soft-sided books, dictionaries, magazines and telephone books neatly upright. Excellent for desktop or shelf. Two quick-change dividers snap in place to make adjustable compartments. Shelf file is made of durable high-impact plastic.